As you may know the new General Data Protection Regulation (GDPR) comes into effect on 25th May 2018. Portmarnock Athletic Club is working to ensure we are GDPR compliant. We are also drawing up a GDPR policy for the club as well as an inventory of data held by the club, and by third parties, for the legitimate purposes of carrying out the club’s activities. Portmarnock AC had their biggest number of entries this year into the Dublin Juvenile Indoor championships, including 15 relay teams up to the age of u15. Thanks to all the coaches and parents for encouraging so many of our athletes to take part and for helping out over the 4 days of competition. For many of our young athletes this was their first experience of competition. We hope it was a good one and that they continue to participate and grow with the club. Helen O'Connor took the O35 Ladies GOLD medal in this years Dublin Athletics Marathon Championchips in a sizzling time of 3:23:41!! Not bad for one who wasn't feeling it the day beforehand!! The O35 Ladies Team consisting of Helen O'Connor 3:23:41 , Mary Harte 3:31:41 & Liz Murphy 3:43:24 took the Dublin Team Silver Medal. Due to his recent excellent form, Portmarnock AC's MIchael Farrelly has been nominated to represent Ireland in the 4x100 at the European Youth Olympic Festival to be held in Gyor, Hungary from 22-29 July. The six sports represented by Ireland are Athletics, Cycling, Swimming, Judo, Tennis and Gymnastics. https://goo.gl/23SVVf — with Gymnastics Ireland, Judo Ireland, Athletics Ireland, Cycling Ireland, Swim Ireland and Tennis Ireland. Michael will also represent Ireland in the 100m at the Celtic Games in August. Below is the list of qualifiers for the National Juvenile Indoors in Athlone. U15 Shot - Eoin Kelly. u17 60m Hurdles - Harry MacKeogh. 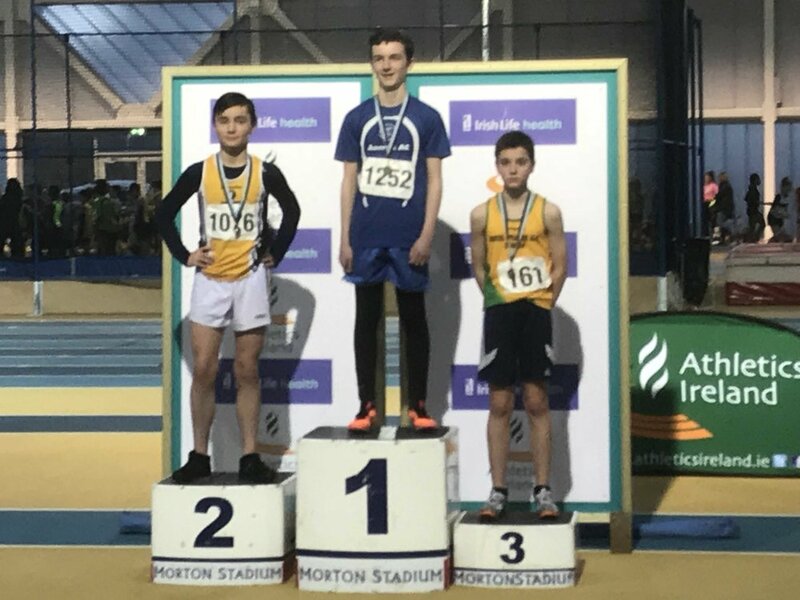 Well done to all the Portmarnock AC athletes who competed in the Dublin Juvenile Indoor Championships at the new Sports Arena in Abbotstown at the weekend. This was the first truly 'indoor' championships in Dublin and it produced some great performances from our athletes. Friday was relays night and our six teams competed with no less than 214 other teams from around Dublin. In the end (11.45pm to be exact!) Portmarnock AC went home with Gold in the u16 Boys 4x200m - Conor Archer, Ronan Patterson, Ciaran McCarthy and Michael Farrelly and Silver for the u14 Boys - Joshua Kelly, Jack O'Connell, Shane Archer, Shane Patterson. Our only girls relay team was our u11s which consisted of Leah Treitlinger, Ava Cotter, Katie Archer, Cadhla Nigfhloinn and Ellan Morgan. The girls ran a great race with fine baton changes and were unlucky not to progress to the finals. There’s strength in depth in our u13s Boys and we were able to enter two teams in the 4x100m relay. Both teams ran fine qualifing races. The U13 teams comprised of Sean Lynch, Harry Byrne, Callum Marshall and Alexan Oyeleye. The other u13 team had Charlie McKeever and Rian Morgan stepping up an age group to complete the quartet with Cormac Ryan and Robert Hussey. Also stepping up to complete an u17 quartet with James O’Connell and Harry MacKeogh were Ronan Patterson and Conor Archer for the 4x200m relay. The lads made it to the final and ran superbly to finish 4th. It was a great race to finish the night off and although everyone at this stage was very tired (it was 11.45pm!) one spectator described the efforts of the Portmarnock team as ‘inspirational’. On Saturday and Sunday more medals were won with Eoin Kelly getting the ball rolling with Gold in the U15 Shot. 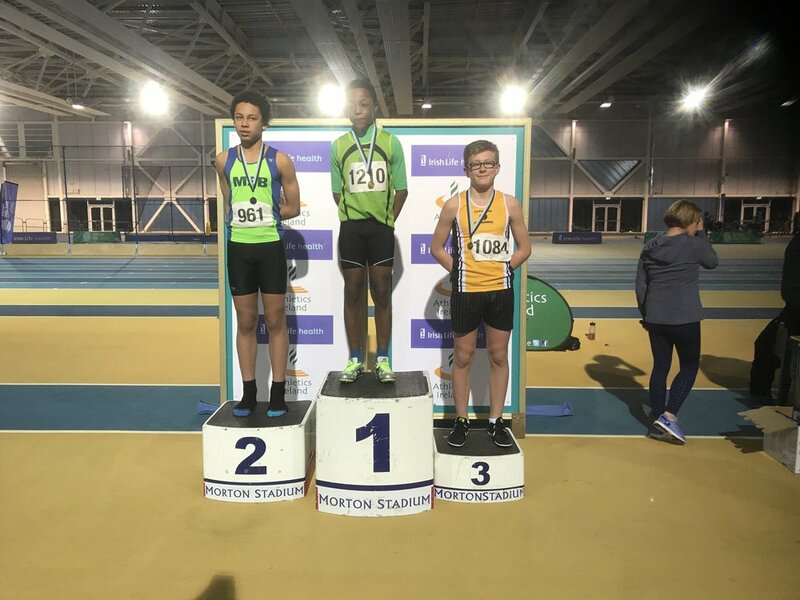 In the U13 Boys 60m Portmarnock were well represented with Alexan Oyeleye winning Silver and Matthew O'Donnell, on his first competitive appearance for the club, won Bronze in the same event. Another bronze was won by our u17 hurdler Harry MacKeogh in the 60m hurdles. U14 boys Shane Patterson and Jack O'Connell produced great jumps in their long jump competition to take silver and bronze respectively. Jack then went on to run a great 800m - leading from the start, as he does - and finishing in Gold medal position. 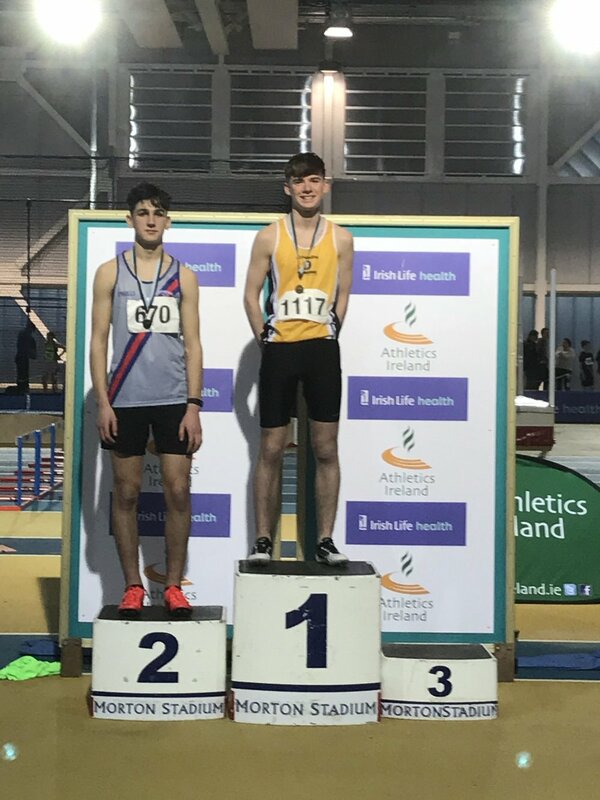 Not to be outdone by their younger club mates, the U16 Boys added to the medals with Michael Farrelly winning no less than three Gold medals in the 60m, 200m and long jump. Not far behind him was Ronan Patterson who took Bronze in the 60m and the 200m. All in all it was a great weekend of competition. Besides the medals there were great performances with many of our young athletes reaching finals. 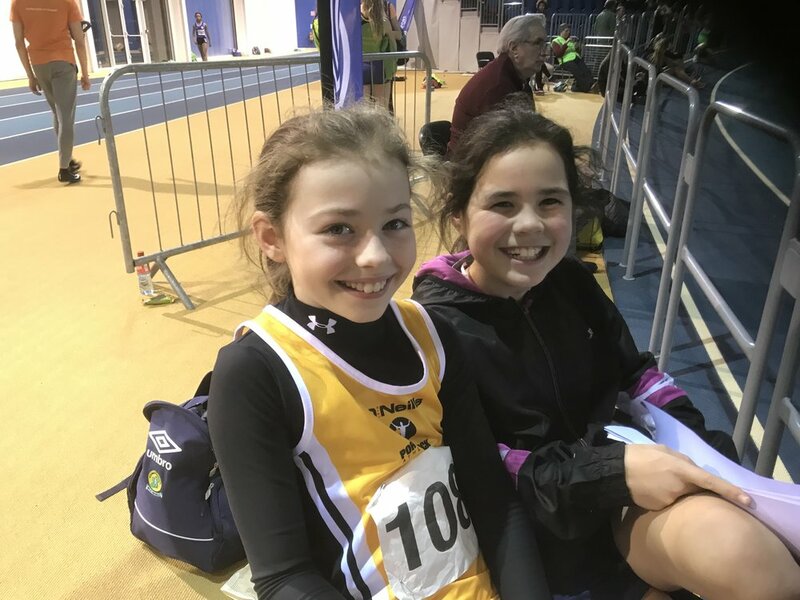 Aswell as being a member of the u11 girls relay team Ellan Morgan ran in the u10s 60m and ran a fine 500m to qualify for the finals where she was just out of the medal positions. Ava Cotter, Cadhla Nigfhloinn and debutants Leah Treitlinger and Megan Comiskey competed in the Girls U11 60m with Ava qualifying for the semi finals. Our middle distance runners in the Girls u11 were Carragh Kelly, Leah Treitlinger, Megan Comisky and Joanna Berry who all put in good personal performances. Robbie O’Connell, Charlie McKeever and Rian Morgan were our u12s Boys representatives in the 60m with Charlie making it through to the semis. Rian also competing in the 600m and Charlie took part in the long jump. There was plenty of activity with our u13 Boys with Cormac Ryan and Harry Byrne competing in the long jump. Cormac and Harry were joined by Sean Lynch and Callum Marshall in the 800m. Sean, Callum and Cormac all took part In the 60m hurdles with Sean and Callum reaching the final and finishing joint 5th to each other! Robert Hussey and Cormac Ryan also competed in the 60m. Connor Reid and Shane Archer took part in the u14 long jump with Shane finishing 5th while Connor also competed in the 800m. U15s Danielle McFadden showed her pace by qualifing for the finals of the 60m and u15 shot gold medalist Eoin Kelly ran the race of his life in the 800m to qualify for the final. Roan Oyeleye took part in the u15 Boys 60m and just missed out on qualifying. Our only u16 woman was Heather Marshall who ran well in both the 200m and the 800m. In the u17s Alannah Byrne also had a fine run in the 800m as did James O’Connell in the 200m and was also a finalist in the 60m. James then went on to claim 4th in the long jump. So it’s a big ‘clap on the backs’ to all the Portmarnock AC team. You’ve all done your club, coaches, families and yourselves proud. Membership for 2017 is now open at the following site for Seniors and Fit4Life (Nursery and Juveniles are full). Instructions can be viewed here. Day 1 of the Leinster Development Squads will take place on October 15th in Morton Stadium, Santry. Events covered will be Sprints, Middle Distance, Shot, Long Jump. The Development Squad takes place from 11am – 1pm on each day and is open to all athletes aged 12 years +. The squad will cost €5 per athlete each day. Please check in at the stand in Morton Stadium from 10.30am. By car from the M50. Take the exit at junction 6 on the M50 for Blanchardstown. Keep going straight on the Navan Road towards Blanchardstown, take the exit to the left for Blanchardstown S.C and stay in the right hand lane. Take a right at the top of the slip road and cross over the bridge. Take the first exit off the small roundabout at the other side of the bridge. Continue up Snugborough Road and take a right at the second set of traffic lights into the National Aquatic Centre. 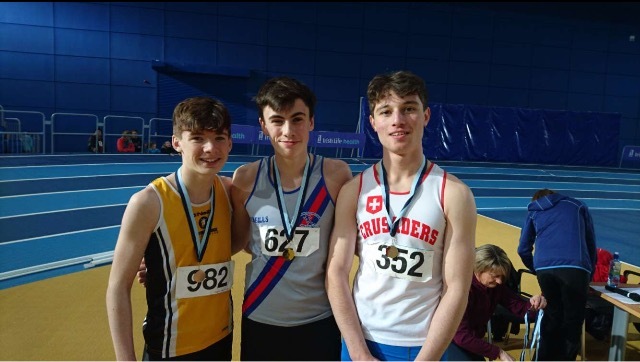 Michael Farrelly, Ronan Patterson and Conor Archer produced a clean sweep in the u15 200m at the recent Dublin Championships. The trio will now compete in Tullamore at the Nationals in July. Below is the list of Portmarnock AC Juvenile athletes who have qualified for the National Championships. Anyone unable to compete please contact Simon on 087 2057247.
u13 Boys relay team: Joshua Kelly, Shane Archer, Jack O'Connell, Shane Patterson. u15 Boys relay team: Mark Morris, Conor Archer, Ronan Patterson, Michael Farrelly. Friday 3rd June 2016 (DAY1). U10 500m & U11 600m are Dublin only competitions, not qualifiers for Nationals, the medal winners (3 fastest overall from the heats) will be decided on times on the night. U12 & U13 Finals will be in Tallaght on Sunday at 12.30pm followed by the U14/15 & 16 800m will take place in Tallaght at 12.30pm with finals of the U14 girls & boys and U15 girls at 3pm approximately. Athlete must be registered for 2016 and are advised to be present 1 hr in advance of their event. Please check your entry. (Click on list to enlarge). Registration/Entry on the day of competition - Athletes will be issued with a label/number for the respective age group on payment of €3. One official from each club should pay for and collect the labels/numbers on the day of competition. The top six athletes in each age group with the highest points total accumulated from the 4 league competitions will be awarded trophies. All competing athletes should be currently registered with the AAI for 2016. Checks may be conducted and any athlete not currently registered will be disqualified. Clubs must adhere to this condition, as non registered athletes are not insured. In the event of contests clashing, officials will show flexibility, ie if a competitor is involved in long jump contest and a track event/other field event is called, he/she will be facilitated to participate in both, but must inform the official(s). Parents and supporters are not permitted on the track or infield areas. Please cooperate with, abide by and respect the decisions of the voluntary officials and organisers of the competitions. All should help keep the facilities we use clear of rubbish. Please use rubbish bins where they are provided or bring your rubbish with you when leaving!